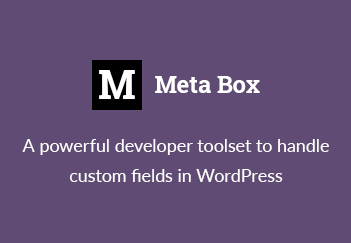 As I said in a previous post, I was planning to put Meta Box Script on the plugin repository at WordPress.org. After 3 weeks of fixing some small bugs in version 4.0, today the plugin is now available at WordPress.org. The main purpose of forming the script as a plugin and putting it on WordPress.org is easy upgrade. So, themers, if you’re using this script by including it into functions.php file, you should consider to use it as a separated plugin (although it still works in theme). And at last, I’m open to hear your opinions and questions. If you find a bug, please report at GitHub (it’s easier to keep bug tracking there). By the way, the documentation at the project page is old but still valuable. I’m moving it to GitHub, too. Could you please make a tutorial to show me how to integrate metabox to theme? There’s a documentation for it here.